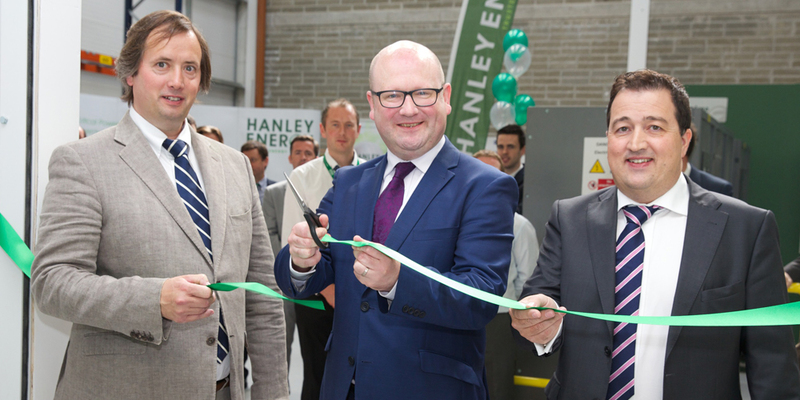 Hanley Energy officially opened their new Data Centre Research and Development Hub at their Stamullen headquarters on Thursday, 6th August 2015. The launch, officiated by Minister of State at the Department of Jobs, Enterprise and Innovation, Gerald Nash TD, invited a wide range of guests encompassing industry leaders and government organisations to experience the new state-of-the-art facilities. I am delighted to officially open the Hanley Energy Research and Development facility at Stamullen. Impressive local firm with global ambition. It’s a real pleasure to be involved and here’s to your continued success. Our new Research and Development Hub is Ireland’s premiere facility in the simulation of a data centre environment. The Data Centre Research and Development Hub is a centre of excellence for the design of new products for the data centre industry. In addition to the Research and Development Hub, we are delighted to have Minister Gerald Nash open our Data Centre training facility. This centre will enable us to train data centre operators and engineers to manage every operational eventuality that presents within the day to day running of a data centre. Hanley Energy continues to recognise world-class potential through the development of innovative new technologies. (L-R) Dennis Nordon, Hanley Energy Managing Director; Denis Cummins, President of DKIT; Kevin Stewart, Acting Chief Executive of Meath County Council; Minister of State at the Department of Jobs, Enterprise and Innovation, Gerald Nash TD; Thomas Hunter McGowan, Chief Executive of InterTradeIreland; Clive Gilmore, Hanley Energy CEO. Hanley Energy are proud to state that new jobs were created as part of the growth phase and establishment of the Research and Development department and there will be future recruitment plans as this department develops further. The globally-recognised Irish-owned and managed company recently announced the opening of a new manufacturing facility and sales office in New Jersey, USA – increasing their expanding operations which currently includes offices in Germany, Scandinavia and the US. Hanley Energy are market-leading specialists in energy-efficient data centres. They supply, design, install and support data centre control equipment and critical power solutions.